This beach is located in Dehesa, a little town that is part of Ribadeo and 12 km from the city. It is a spectacular beach when the tide is low. You can enjoy a wonderful walk between the arches that the sea has created through time. You can also find multiple caves that are quite deep. It is one of the clearest examples I have seen of the power of nature, when you are there you feel insignificant. Even if the tide is high, you can have a walk on the edge of the cliff or have a beer with fantastic views from the restaurant Las Catedrales. The prices are high, but it is worth it. 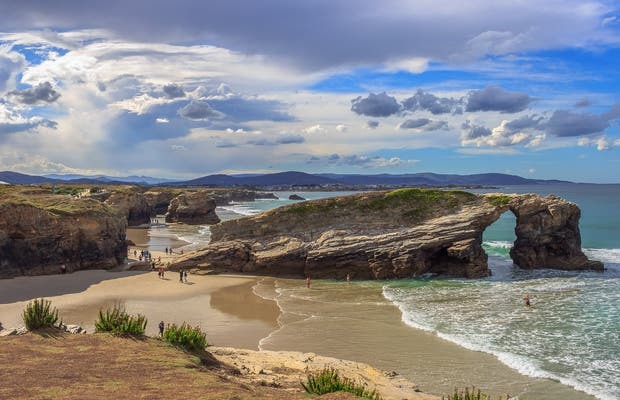 The Las Catedrales beach is known as Praia de Augas Santas (Holy Water Beach) in Ribadeo because of how monumental its cliffs are, whose forms and caves remind us of the arches inside chapels. To be able to contemplate its most spectacular corners, you have to go there when the tide is low, since when it is high some of the caves are not accesible. If you go when the tide is high, you can see the beach walking on the upper side of the cliffs towards the Esteiro Beach…but it is not the same. You need to calculate when the tide will be low so you can go down to the sand and appreciate the magnitude of the cliffs and the depth of the caves with its arches that are more than 30 meters high. It is, without a doubt, one of the most impressive beaches in Galicia and in Spain. It was declared natural monument, and only when the tide is low you are able to discover the wonderful traces that erosion has left on the rocks. The rocks look like cathedrals with an altitude of more than 30 meters and where you can find forms of flying buttress, caves that look like windows and long stretches of sand. This summer we payed a visit to this beach and we can say that it is wonderful. The impressive walk between the rocks when the tide is low is worth it. Besides being a beautiful beach, it is well prepared for the visitor, with toilets, tables and benches, a nearby restaurant and plenty of parking space. It's interesting to see the beach at high tide crossing the top of the cliffs to the west-east towards Esteiro beach. See it at low tide on the sandy beach to appreciate the magnitude of the cliffs and the evolution of various furnas or sea caves - from small cracks to caves where the roof has collapsed just by the erosive action of waves and sea water.